Nestling in a unique mountain scenery, Davos is the highest town in Europe and also one of its largest winter sports areas. 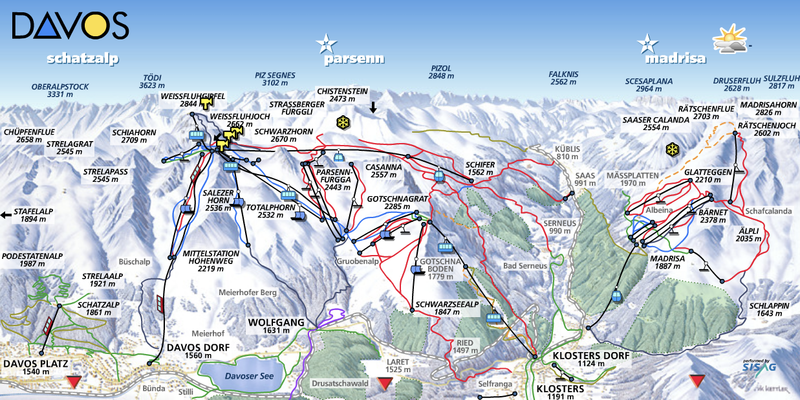 The ski resort offers varied slopes ranging from an altitude of 1,560 to 2,844 m. There are numerous ski lifts taking skiers and snowboarders up to the mountain tops. The ski resort Davos is a winter sports metropolis and almost an eldorado for snowboard and downhill fans as well as Nordic skiers, ice sports enthusiasts and winter walkers. Five sledge runs of a length between 2.5 and 8.6 kilometres guarantee toboggan fun in the region. Davos is a really big and well prepped area. It is expensive as everything else in Switzerland but I would love to come back. Really high quality everywhere. Damning article by Brazilian #indigenous leader @Dinamam in response to President #Bolsonaro's words in #Davos.